Resource conditions may allow consideration of a dual-flash plant. Substantially similar to a single-flash plant, a dual-flash plant is capable of utilizing more of the total flow from the reservoir than a single-flash plant. This increase in resource utilization comes with a corresponding increase in plant complexity and cost. In a dual-flash configuration, water leaving the first separator is directed to another separator where a lower pressure generates additional steam production. 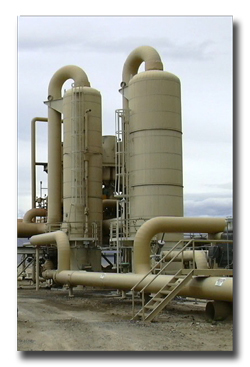 At this point, both high and low pressure steam have been produced and are directed to the plant in separate pipelines. The water from the second separator is piped to injection wells in a similar manner to a single-flash plant. The high and low-pressure steam are directed to separate turbines, each designed for the specific inlet pressure available. The balance of plant is similar to that of a single-flash plant, including the vacuum system, condensers and cooling tower. Resource conditions are important as the mineral content of the water is concentrated somewhat in a dual-flash arrangement. A resource with a high mineral content may not be suitable if, after increasing the concentration, the risk of scaling becomes unattractive.